Gucci's "911 Emergency" vid debuts on "106 & Park" today. PREVIOUS: TIDBITS: Devin Thomas Covers KRAVE+Ciara Covers Britney+Trina Parties In D.C.
NEXT: VIDEO FAB: Teairra Mari's "Automatic"+Kelly Rowland's "Commander"
Why does she and Gucci Mane's lip color match? not tryin to hate! but Keyshia D has a funny shape...and she is alright, not really breath taking! IDK..maybe its jus me.. I love Keyshia. In a world of people being famous for the sake of being famous, she's managed to use her style to attract and keep everyone's attention. To the naysayers, you had to click on the story to comment so her strategy must have worked. I'm not crazy about Gucci's music, but if they are an item, more power to 'em. I think her beauty compliments him well. im not feeling the white lipstick but im glad her teeth are just as white =) good look girl, she's cute too; ::vomiting:: from looking at gucci! Lol! 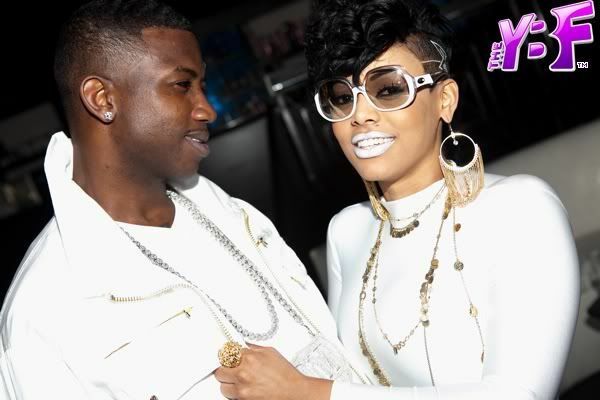 The Keyshia girl is pretty, but who CARES if she is with gucci bc it's not gonna last. I am not feeling the white lipstick at all. WHO are these people again? LMAO NEXT!